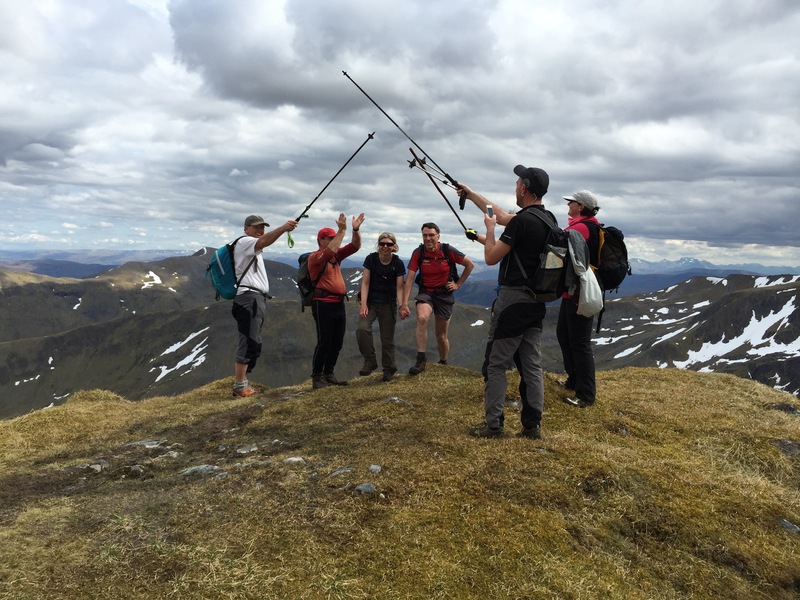 Just 6 Munros left to do as we headed to Scotland for our annual week's trip. 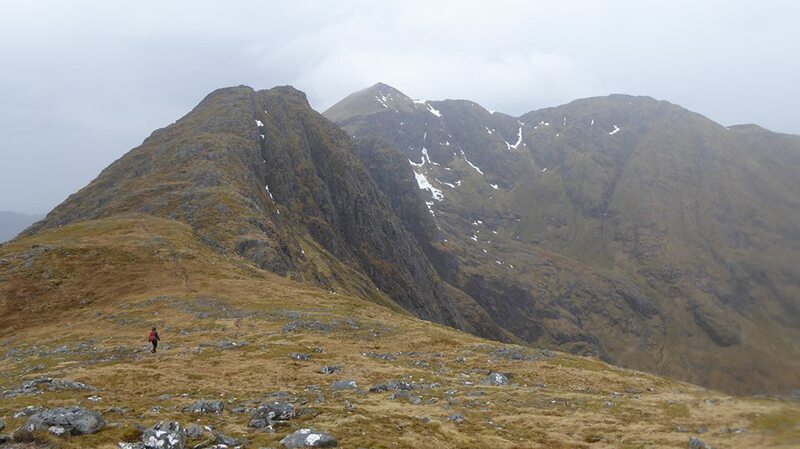 The plan was to finish them over the Bank Holiday the following weekend, when the club was staying at Glen Affric, as 5 of the 6 comprised the Cluanie Horseshoe, which is best done from the north. This needed good luck with the weather though, it would be thoroughly miserably doing a long hill day in the rain. The 6th was Ben More on Mull, so we spent a few days there. What a great place! We had the benefit of a high pressure system just west of Scotland, so while England and Wales shivered in the rain, we had wall-to-wall sunshine. As well as walking up Ben More and its adjacent Graham Beinn Fhada, we had a trip to Staffa (Fingal's Cave) and the Treshnish Islands (puffins galore! ), and also did a spot of cragging. Not world-class climbing, but the wonderful location automatically added a star to everything. 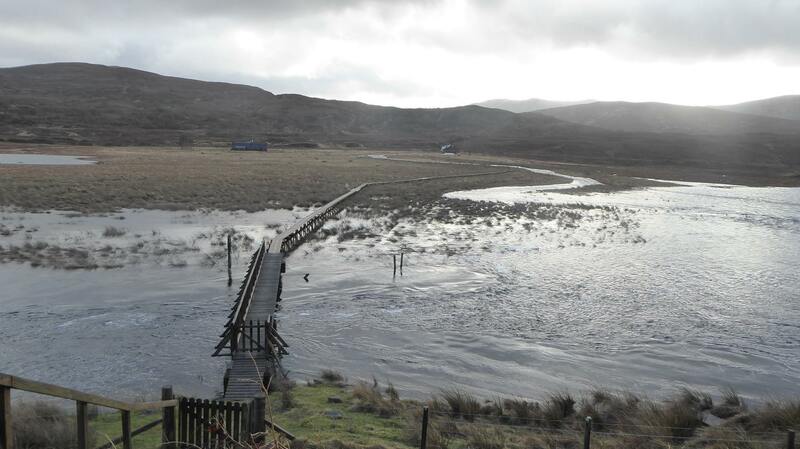 And the campsite at Fidden is brilliant. After watching some dolphins swim by in Tobermory harbour we took the ferry back to the mainland for a long drive out through Ardnamurchan (we really need a club trip there!) 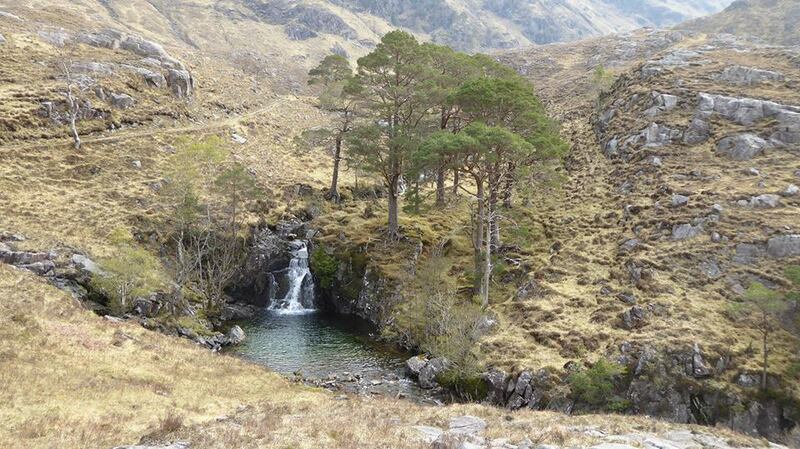 and Ardgour. We decided to spend the night at Invergarry so we could do a quick ascent of Carn Ghluasaid, the outlying Munro of the Cluanie group. This meant that the 4 remaining summits formed a more reasonable day's objective without a long there-and-back detour. So all that remained was to drive to Glen Affric (about 10 miles as the crow flies, but 2 hours by road) to meet up with the club. Low cloud greeted us on Saturday morning. 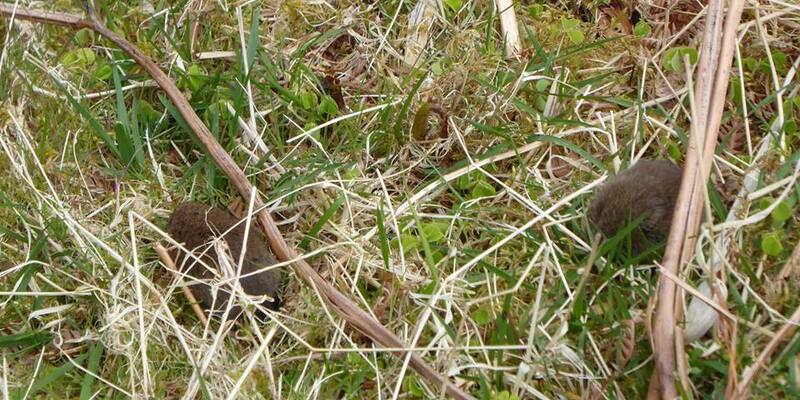 But we remained optimistic that the weather would improve to give the forecast sunshine. Charles set off first, intending to add a Corbett to the round. Carmen and I, along with Rob and Annie, followed 90 minutes later to do all 4 Munros. 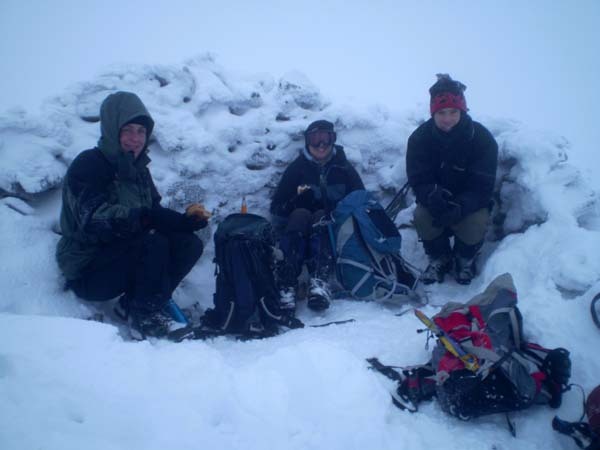 The others (Simon, Debra, Peter and Karl) planned to do the final two, meeting us at the summit of our 3rd. The cloud burnt off to give a sunny day. After a couple of diversions for some Munro Tops we somehow arrived at the top of A' Chraileag within minutes of the others. 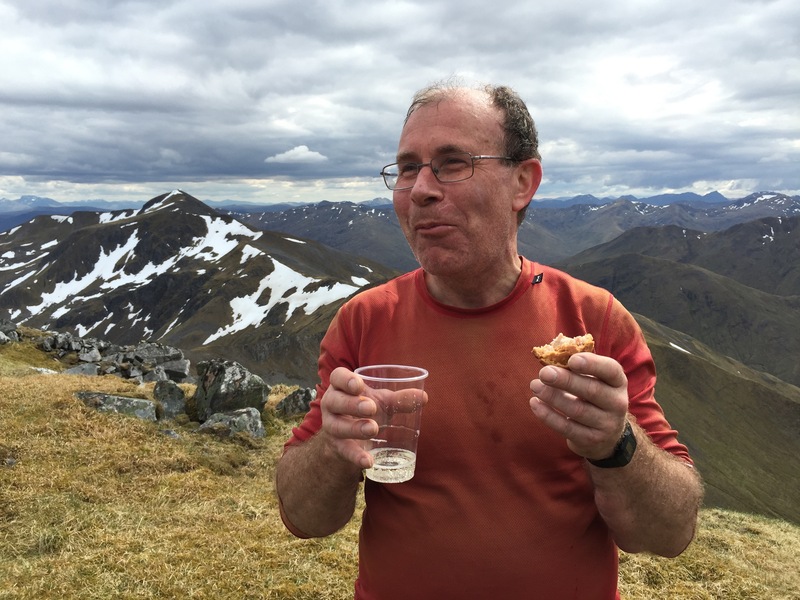 All that was missing was Charles, whose ambitions were stronger than his legs, and eventually descended after a Corbett, 2 Munros, and a few Tops. 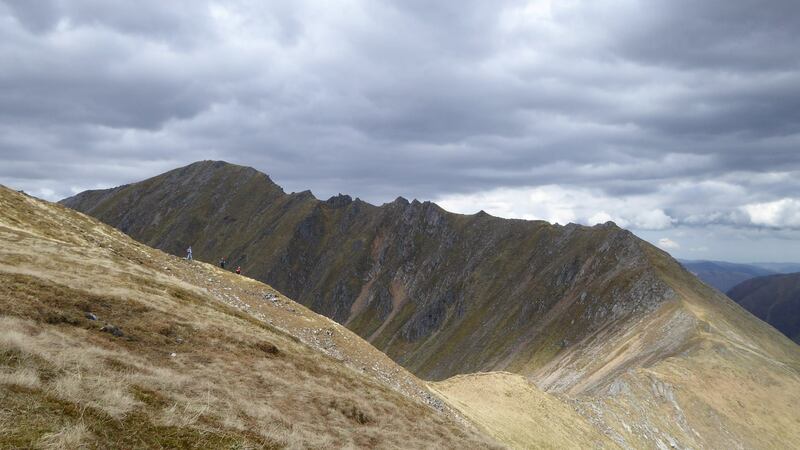 Our final Munro was Mullach Fraoch-choire ("Hill of the heathery corrie"), and what a fine hill it was, shapely and with some fun scrambling up the south ridge. 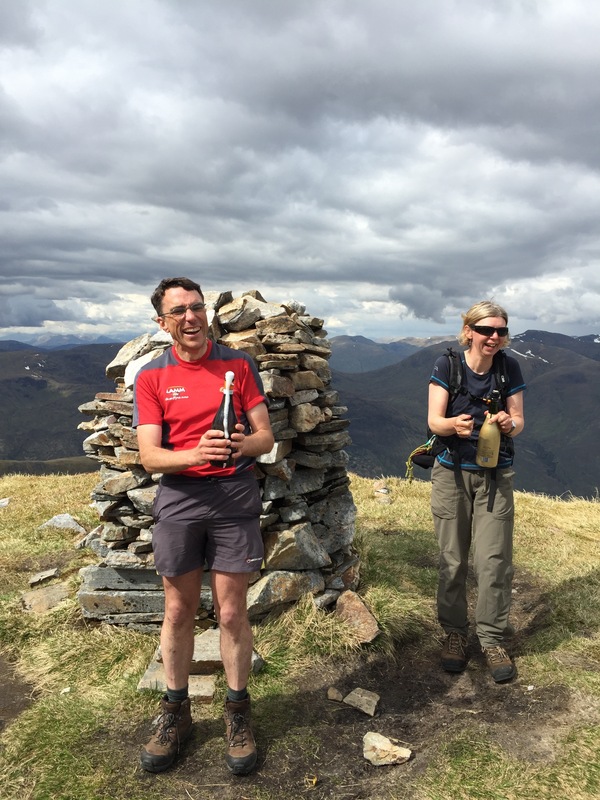 As we arrived at the summit, Simon and Karl produced a couple of bottle of fizz from their rucksacks and we all celebrated in style. A brilliant end to a long campaign (27 years for me, a rather more sprightly 16 for Carmen), made extra special by the weather, the location, the company, and of course the bubbly! 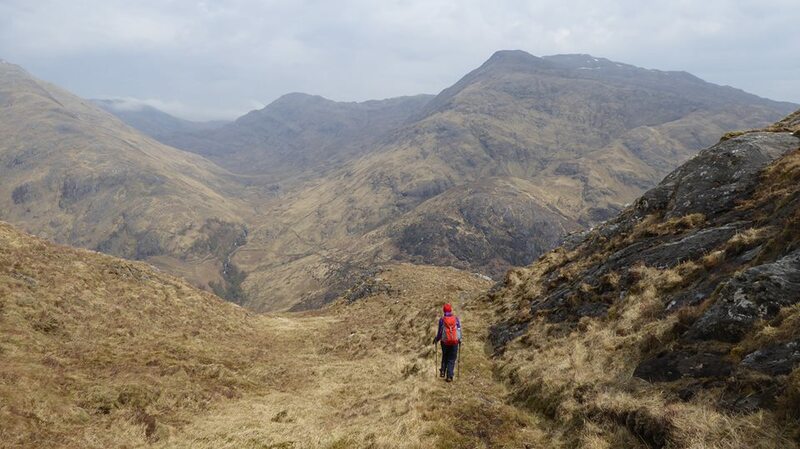 With warm summer's weather forecast for the weekend, Carmen and I took the opportunity of a quick trip to Knoydart to finish off one of our last remaining Munros, Ladhar Bheinn (which as you'd expect is pronounced "Lar-venn"). 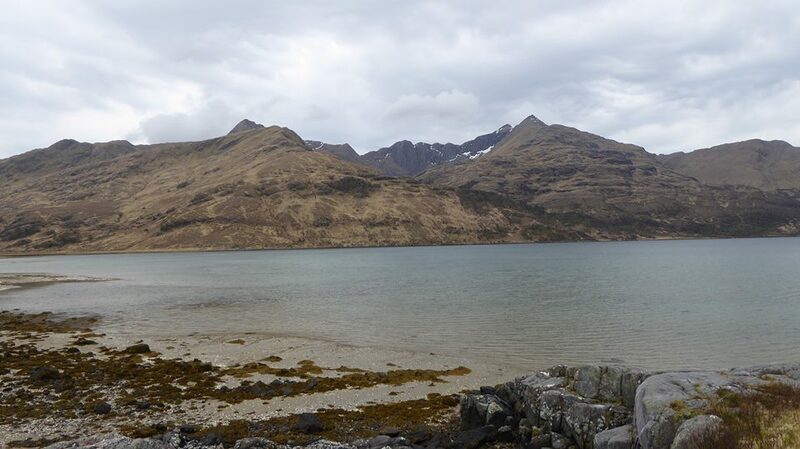 After a short 7.5 hour drive on Friday evening we camped at Kinloch-hourn. An early rise on Saturday morning to beat possible late-afternoon rain saw us walking by 7.30. Cloudy and cool but dry, it took us a little under 3 hours (with a brief pause to photograph some tribbles) to cover the 7 miles or so to the bothy at Barrisdale. We pitched our tent outside the bothy. 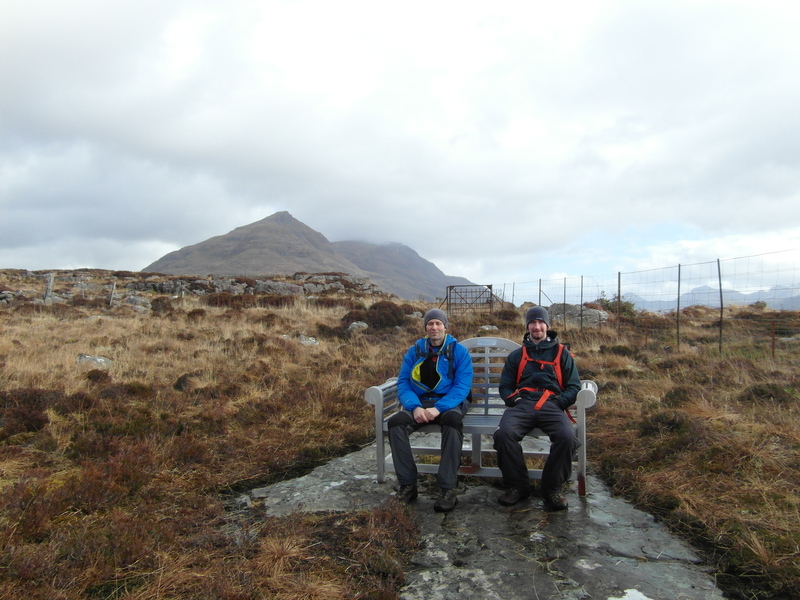 No time to delay so we set off for Ladhar Bheinn. Far from burning off as expected, the early cloud seemed to be thickening, and it wasn't long before the rain started. The cloud base was high though, well above the summits, so we had good views despite the rain. 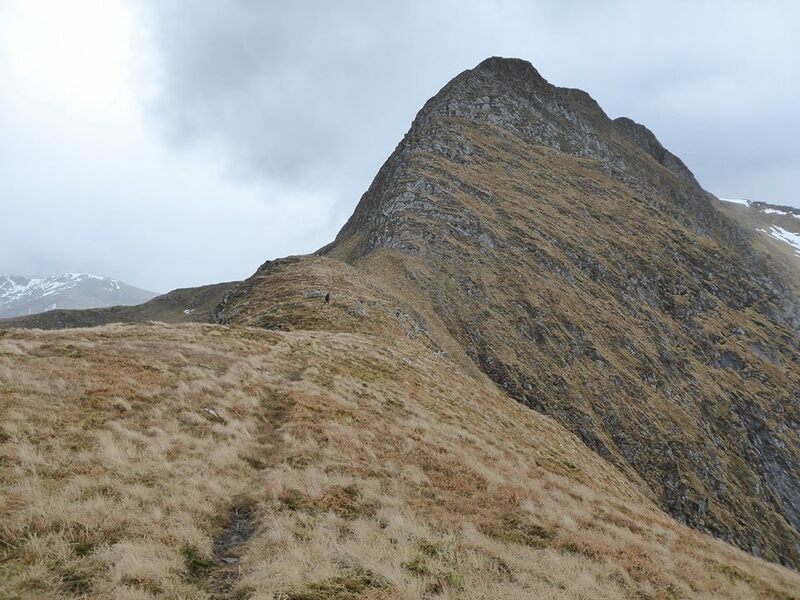 A short but steep and vegetated scramble up Stob a' Chearcaill was made more exciting by the damp. 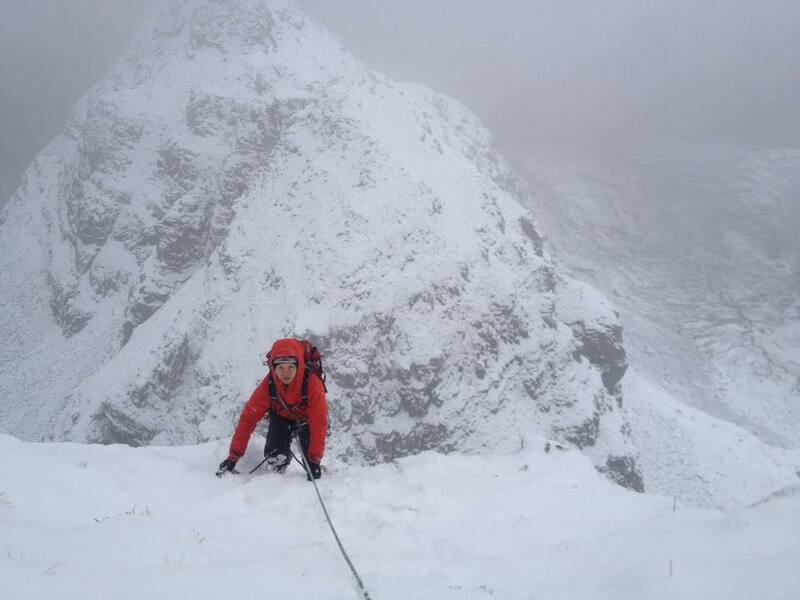 Then a traverse over a couple of small tops and another steep climb led to the short summit ridge. The rain stopped at last, and as we walked out and back to first the high point and then the trig point 300m beyond, the sun even made a weak appearance. The trig point appeared candle-like with the recent addition of a large rock. I expect someone got a large Arts Council grant for it. We descended over the Top of Stob a' Choire Odhair and into the fine corrie of Coire Dhorrcail before picking up an old stalkers' path back to the bothy. Another 7 hours or so making a 10 hour day, 16 miles and 2200m ascent, rather more than expected from a glance at the map! 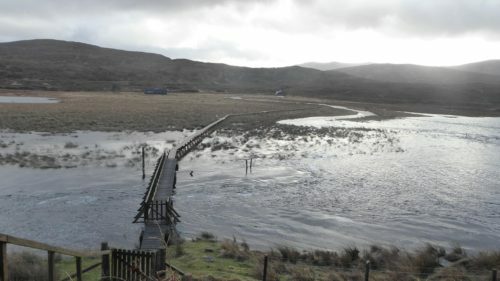 The promised rain held off long enough for us to eat in the dry, but it then set in for much of the night, so thoughts of an evening stroll by the sea were quickly abandoned. Sunday's weather forecast was for a little low cloud first thing, swiftly lifting to give a warm or even hot, sunny day. So we were disappointed (though not surprised) when we emerged from the tent to find the cloud even lower that Saturday, the temperatures the same, but with the addition of a strong wind. Our plan had been to walk out up Glen Barrisdale then via a grade 3 scramble up An Caisteal, a traverse of Graham Meall nan Eun and Corbett Sgurr nan Eugallt before descending to the glen just a mile or so from the car. But the wind was strong enough to make walking a fight at times, so with a lot of the rock still damp after the night's rain we quickly abandoned the idea of a scramble, missed out the Graham, and instead slogged up the steep hillside to the low col SW of the Corbett. Still cloudy and windy with no sign of the sun, we were at least dry, and again the cloud base had lifted high enough to clear the tops – though a thick haze prevented much in the way of views. 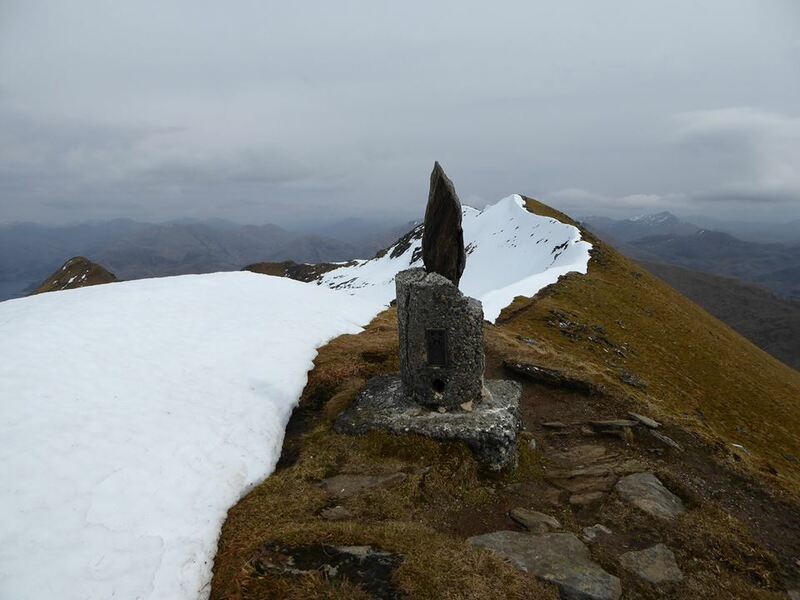 A false summit (Sgurr Sgiath Airigh) with a fine cairn was followed by the real summit with a tiny cairn, and then a few hundred metres away by a 3rd top where the trig point was found (did they always put the trig somewhere other than the high point round here?). Well worth having the Harvey map for this hill, as the OS maps still show the trig point as being the highest. A descent of the NE ridge led to a very old stalkers' path, becoming boggy and hard to follow in places after years of neglect but a delightful route nevertheless. Even better, the sun finally deigned to make an appearance, and by the time we reached the car at about 2pm the temperatures had soared to a massive 15C. So where was the heatwave we were promised? 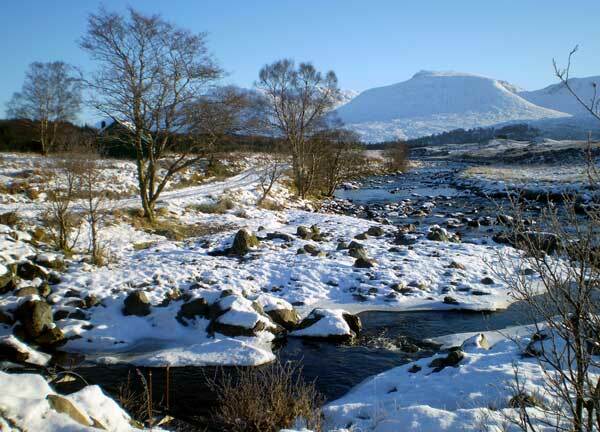 We met it at Fort William, just 20 miles to the south, where the temperature was 25C! Despite the disappointing weather we had a great weekend, it's hard to go wrong in Knoydart! Just a shame about the long drive. Attempt 1) All attempts at testing the jacket on day one failed due to brilliant sunshine and the exertion of slogging up the Black Mount through knee deep powder snow. 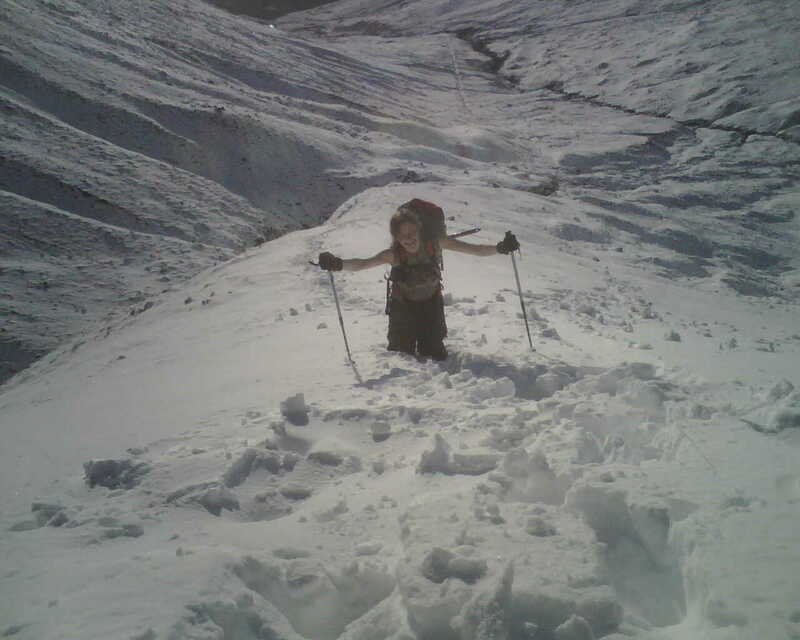 By the time we reached our first summit, Stob a Choire Odhair, we looked a strange sight – our bottom halves swathed in big boots, gaiters and waterproof trousers, our top halves in sleeveless T shirts. Alastair even had shades and a sunhat on. The real air temperature became all too evident once we sat down, we had a hasty lunch then arse-slid down the hill to the bealaich whooping with glee. 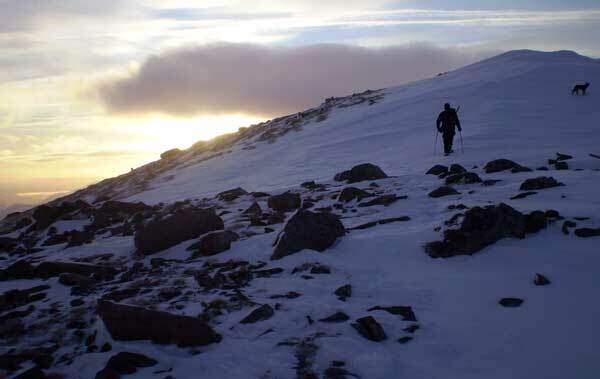 We slogged our way up the ridge to Stob Ghabhar and reached the summit cairn just as the sun was setting, then paused to take in 360 degrees of pink tinged snow covered mountains with bronze glints from the occasional loch. Head torches on hand, but not required – we finished our descent in brilliant moonlight reflecting off the snow. Attempt 2) Fine test conditions. A chilly wind and incoming cloud. We headed for Ben Chonzie. 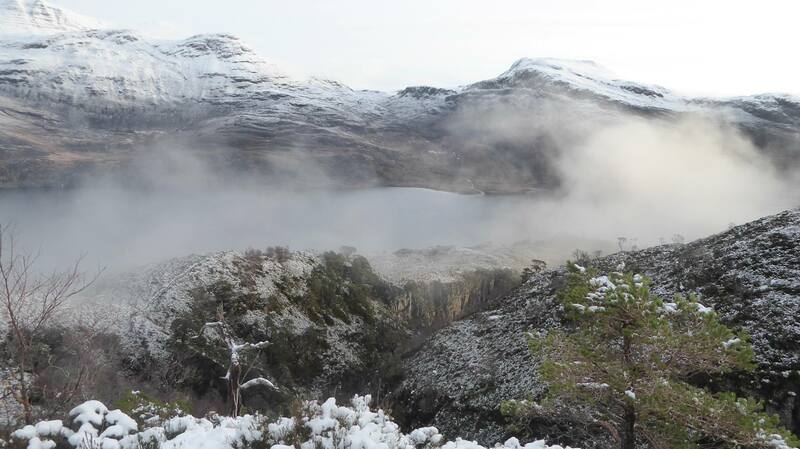 Reputedly the dullest mountain in Scotland, Ben Chonzie is known for "collecting the snow". After saturdays 12 mile extravaganza I was knackered before we started and made heavy work of the plod uphill. At the summit near white out conditions descended and a bitter wind dropped the effective temperature to -12 or less. I was very taken by the grotesque rime formations, but few photos were taken as removing gloves for even a moment caused stingingly cold fingers (must get some liner gloves). The snow was drifting and at places we broke through the crust into thigh deep holes. A fine chance to test the jacket! Out in came in all its magenta glory, and I am happy to report that combined with a gortex layer it was toastily warm even while sitting on snow eating sandwiches.